Are you a football fan? We are! 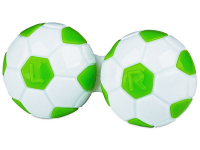 Have some fun with your lens care with this practical lens case made of plastic with a green football design. Thanks to the „L“ and „R“ symbols on the caps, you´ll know exactly how to store your lenses correctly. Cases like this are only necessary to store monthly and bi-weekly lenses that require overnight storage and cleaning. Proper lens care also requires a high-quality contact lens solution, and we're proud to offer all of the most popular brands on the UK market. You can also get this football case in black.